The Strongest and Most Durable Tooth Loss Solution! Since the invention of dental implants in the 1970’s and 1980’s and the beginning of implants in dentistry, the Dental Implants in Ocala has seen tremendous advances in the technology. Implants are now permitting us to accomplish things we never would have been able to accomplish previously. At Weldon General & Cosmetic Dentistry, we are thrilled to be offering the residents of Ocala dental implants technology and treatment that is cutting edge. Below is some great information regarding implants. We of course welcome questions if you would like to discuss your individual situation. Dental implants are a permanent way to replace a missing tooth, multiple missing teeth, and an incredibly successful addition to treatment that involves the entire mouth. A dental implant is essentially and artificial tooth root that is permanently anchored in the upper or lower jaw bone just like real teeth. Implants look and function just like real teeth. No more slipping, uncomfortable dentures! 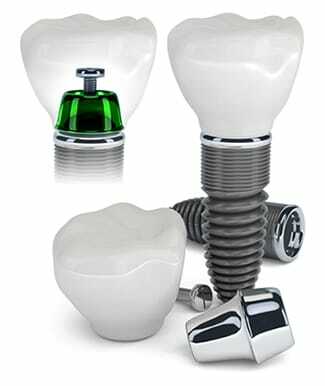 Dental implants are seen as the future of dentistry and the future is here. Implants are not a new form of treatment and recent developments have made it one of the most successful and predictable treatments that a dentist can offer. Feel free to check out our smile gallery page showing some of our work utilizing implants! A dental implant is generally constructed of titanium. The implant is placed into the jawbone in the site of a missing tooth. Due to a process termed “osseointegration”, the bone essentially grows together with the implant itself. The result is an extremely strong foundation. Screwed into the implant is an abutment. This is essentially a connection between the implant and the crown that will be placed on top. The crown is the visible portion of the tooth replacement. The results often cannot be distinguished from a healthy natural tooth. Dental implants give you a much stronger foundation compared to any other tooth replacement. They allow for natural functions like chewing, even if your favorite foods include steak, corn on the cobb, apples, nuts or any other foods you couldn’t eat before. Implants replace the root and the tooth, unlike bridges and dentures which only replace the visible crown. This also means no other teeth require buffing down to act as an anchor. Because implants are anchored inside your jawbone, the bone is being stimulated any time you’re chewing. This stimulation allows you to keep your fullest biting force and prevent the bone from shrinking, which is very common among individuals with tooth loss. Dental implants have incredibly high success rates. Even after a 10-year period, dental implants see success rates as high as 97 percent. This proves that even after many years, you can rely on them for everyday use. The endosteal (in the bone) dental implant procedure is a multi-step process. After you’ve completed a comprehensive exam with Dr. Weldon, an evaluation of the proper X-rays, and a thorough consultation, you’ll be able to begin your dental implant treatment. If there is not enough jawbone present for placement, a bone graft will be performed to create sufficient bone and anchor the implant. Once the bone has fully healed, a hole is created inside the bone and the implant is placed. This dental implant will essentially serve as a replacement root structure for the tooth, allowing it to be anchored into the jawbone. Once the implant has integrated and healed, the abutment can be placed on top. Over the course of several weeks, the surrounding gum tissue will heal around the abutment. Once complete, the restoration will be placed on top. There are many ways implants can replace teeth. Here are three of the most common you should consider! If you’re missing a single tooth, an implant and an implant-crown paired with a single abutment will suffice. The crown is made entirely from porcelain in order to provide the most natural-looking esthetic possible. A traditional bridge can be made to replace three or four consecutive teeth. However, instead of using neighboring teeth to anchor a restoration, two implants are placed on either side. If you are missing an entire arch of teeth, an implant-supported denture can be placed using only four to six implants. Implant-supported dentures are similar to traditional dentures except they don’t use oral structures in the mouth to stay in place. Instead, they are custom-made to snap onto dental implants. They can be designed for removal or to be fixed. Implants are cared for much like natural teeth. You’ll still need to brush, floss and visit Dr. Weldon on a regular basis. While the crown cannot decay because it is made from inorganic material, the surrounding gum tissue can still become infected. Many people believe that an implant will allow for neglect of oral healthcare procedures, but this is far from true. Implants can suffer from implant mucositis which is analogous to gingivitis and peri implantitis where the body begins to destroy the bone around the implant due to a chronic infection. If you want to avoid these issues, routine care is an absolute necessity. With normal exams and adequate care, implants are an extremely successful and predictable form of treatment. Every mouth is different, and the cost of dental implants depends upon the needs of the individual patient. Frequently, a large portion of the dental implant cost is covered by insurance. Weldon Dentistry is an insurance friendly office and we file dental insurance as a courtesy for our patients. However, because of the wide variation in policies and coverage, the out-of-pocket cost for dental implants can vary greatly. We also provide a healthcare financing option for our patients without dental insurance. You can read more about payments and financing by clicking here. Either way, it’s important to note that dental implants are a long-term investment. They’re often considered the most cost-effective option for tooth replacement because of their function, esthetic and long-term durability. It’s common for implants to last several decades without any issues, assuming oral care is practiced. It would be challenging to find a dental implants dentist in Ocala more qualified than Dr. Weldon. Doctor Weldon is a fellow in the International Congress of Oral Implantologists. The ICOI accreditation process provides practicing dentists with terrific education and training regarding dental implants. Learn more about Dr. Weldon‘s education, background, and community involvement by visiting our practice. We would be glad to see you in our office for a complete evaluation, where we will do our best to develop a health plan to make dental implants affordable. Feel free to contact us electronically or call us at (352) 484-0469.